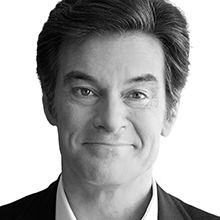 Dr. Oz has won seven Daytime Emmy® Awards for “The Dr. Oz Show” and is Professor of Surgery at Columbia University. His research interests include heart replacement surgery, minimally invasive surgery, alternative medicine and health care policy. He has authored over 400 original publications, book chapters, and medical books, has received numerous patents, and participates in 50 heart surgeries per year. He also hosts the internationally syndicated “Daily Dose” in 134 radio markets, a newspaper column in 175 markets internationally, and has a magazine “The Good Life”, which was voted the hottest new publication in 2014 and entered the top ten of all newsstand sales in 2015. He was born in Cleveland, Ohio, raised in Delaware and received his undergraduate degree from Harvard University (1982) and obtained a joint MD and MBA (1986) from the University of Pennsylvania School of Medicine and Wharton Business School. He resides in North Jersey with his wife Lisa and 4 children.